ISN'T THE SORRAIA A BREED BY NOW? HASN'T THE SORRAIA BEEN TURNED INTO A BREED BY NOW? It may well be that what d'Andrade discovered and preserved was a subspecies, or a zoological race, but after having since been bred for generations in captivity, isn't it fair to say that by now these horses have been turned into a breed? That is a valid question. Not enough effort has been made to preserve Sorraias as a wild horse, instead, it has been treated and kept and bred in recent years much like domestic breeds, even in Portugal. As a result, the behavior in most Sorraias has changed, and arguably their phenotype, too, to some extent. However, much of the wild Sorraia behavior can still be observed in some herds. Because most Sorraias have been exposed to humans so much in recent years, and some have been raised along with Lusitanos, they don't shy away anymore when being approached. In the early 1990s there were still many, especially young ones, who would run like deer when someone approached them. However, that's not the point. Sorraias have undoubtedly been affected by the way they were kept and bred in recent decades, but when we discuss their status it is important to not use double standards! 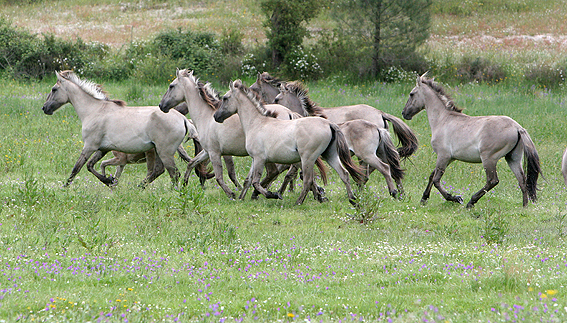 The Mongolian or Asiatic wild horse, known commonly as Przewalski's horse, would be the one to compare the Sorraias with, as its status has never been challenged. And if we make that comparison, then in contrast to the Sorraia, Przewalski‘s horse has been bred even longer in domestication, even in zoos—without the influence of a survival-of-the-fittest selection due to a natural environment. Przewalski‘s horse was generally kept in small enclosures, and taken care of by Man, while most Sorraias lived year-round in natural pastures large enough and secluded enough for them to remain semi-wild, NOT taken care of by Man, except maybe to be tossed some straw out in the field during extreme droughts. However, nobody denies Przewalski's horse its status; nobody would even dream of calling them a breed! 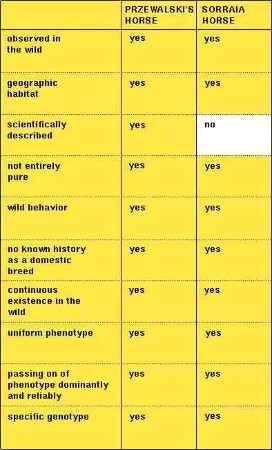 Everything has been the same with Przewalski's horses and Sorraias—registration in a studbook, humans making the mating decisions (in other words, breeding selectively), etc. If one thinks he has to call the Sorraia a breed due to these circumstances, then the same would apply to Przewalski's horse. But regardless of how long Przewalski's horses are bred in zoos, the fact remains that they represent a wild subspecies, and that one cannot deny them, should not deny, or wants to deny them that status. Instead, every effort was made to preserve those horses, and rightfully so, even to reintroduce them to the wild. But then the same holds true for Sorraias—if those circumstances are not held against Przewalski's horse, it would be unfair and illogical to hold them against the Sorraia. This horse … is to be found in the south of the (Iberian) peninsula, and I suppose it is the remaining specimens of a fauna dating from the beginning of the Pleistocene era, which persisted throughout the antiglacial period, when there was a horse related to the Pleistocene horses of the Sivalik Hills, and therefore one of the oldest geological periods of Asiatic origin. In the interglacial period (i.e. the last) it was to be found in Africa, where it may have survived throughout the preceeding glacial period, and also in the Hispanic southwest (Andalucia and Algarve), or it may have retreated from Africa through the isthmus which existed before the Straits of Gibraltar opened, which some believe to have occured in the Tertiary era. 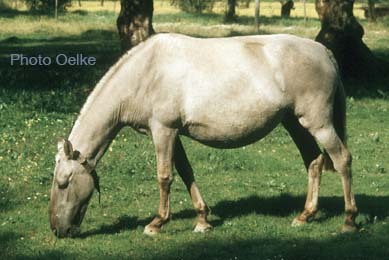 Many years ago I had already noticed that many foals out of mares of pure Andalusian breeding which I was raising in the Alto Alentejo (Elvas region), and others I had seen in Andalucia and in the region of the Tejo delta, were born with striped, straw-colored coats, especially those of yellow dun or grulla (mouse dun) color; many of those stripes later disappeared completely as they became grey. Later, in 1920, on a hunting trip in the region of Coruche, on the lower Sorraia (river), on the 'Sesmaria' land, I saw a herd of ca. 30 individuals, more than half of them were light duns, some were grullas, many with superabundant stripes, and generally in all aspects absolutely wild, or primitive, as if they were a species of zebra, or a hemionus (halfass) species. 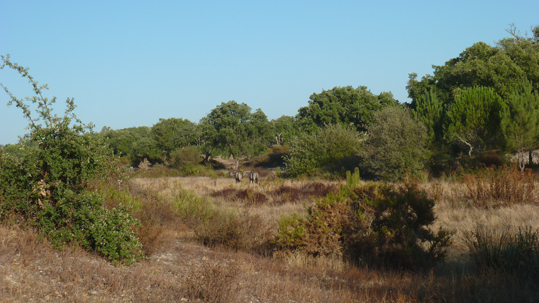 When I later focused my attention on these characteristics which I referred to in my various studies, I was able to find animals with these particular coat characteristics in all areas of the Tagus (Tejo) valley, the Alto Alentejo, as well as in the Guadalquivir valley, all together more than 300 individuals. I then decided to reconstitute this primitive kind of horse, in order to find out if it was indeed the origin of our Andalusian horses, which are nowadays of larger frame und greater variety due to the crossbreeding they have been subjected to. So I set out to duplicate in an exclusive herd on my estate what had happened in the Americas, where through life in an authentic wild state the actual cimarron—or crioulo—(wild type) emerged. ... These reasons lead me to the conclusion that the equine group which I am dealing with here represents a primitive type of the Iberian Peninsula, from which the modern Andalusian and Lusitano stem, a group that interests the Argentinians because it is known that the animals of the Tagus (Tejo) delta and those of the Guadalquivir delta are of the same origin. In fact, our wild bovines (fighting bulls), so common here, and the horses of the Ribatejo are the same as the ones of the salt marshes of the Guadalquivir.